Captivating our customers with our excellent performance, we have maintained our status as a top figure in the industry. 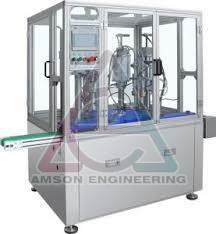 As a Manufacturer, Exporter & Supplier, we take pride in presenting Cream and Gel Mixing Machine to our customers. It is manufactured by skilled experts to make sure there is no compromise with the quality. Its durability and effective performance make it an attractive alternative. The quality on offer is available to our customers for economical prices. Homogeniser Mixer is the proved machine for cosmetics manufacturing Industry to manufacture cream/gel/balm etc. This unit also known as Emulsifier. Very widely used and famous among small and medium production setups. This unit is very economical, easy to operate and easy to maintain type. Any semi-liquids and pasty materials, like cream, pastes, gel and other same kind materials can be easily emulsified by using this machine. Emulsifier units come in various capacities from 2 liters, 10 liters, 20 liters, 50 liters, 100 liters and above. In this, 100 liter capacity unit is considered as a medium/ small capacity since from 10 liters to 100 liters batch can be easily homogenised using this machine. Stainless steel blade and casing is 5” diameter in size. Blade unit is supported by a steel casing over and at the sides are with small holes, from where the material is sucked and emulsified during mixing. Blade design is zig-zag type to get maximum emulsification in less time. Machine weight - 45 kgs. Gross weight - 75 Kgs. Mixing capacity - From10 Liters to 100 Liters at a time.